I got my first black powder rifle in 1988. It was an 8 1/2 Sharps 45-70 with a 26” barrel. I choose this model because I thought I was just going to hunt with it. In March of 1989, Dan Phariss of Big Timber mentioned that there was a Silhouette match at Livingston coming up. I loaded up the 420 grain Lyman bullet & went to Livingston after firing a few shots at 100 yards. It seemed real obvious as I pulled up to the shooting line that these guys were absolutely nuts if they thought they were actually going to hit any of those targets way out there! Steve Garbe & Mike Venturino were two of the fellows at the match. Steve Garbe helped me get some sight settings. The sight on my rifle had no windage and no scale on the elevation and I had no idea about the blow tube. Steve Garbe won that match with something like 19 or 20 out of 40 and I was amazed that I actually hit 9 targets! I was instantly addicted! We went to the Nationals in Raton that year. Steve Garbe won that year with scores of 25 and 23 for a total of 48/80. I ended up with scores of 10 and 13 for a total of 23/80. Scores have certainly changed today! The next couple of years I spent trying to get a more target type rifle and started making bullet moulds. I ended up with a Shiloh Sharps 40-65 #1 Sporter. In 1992, I went back to Raton with Kirk Bryan & Bryan Gregorich, both from Big Timber, and we ended up the National BPCRS Champion Team that year. Kirk & Bryan tied for third place overall with scores of 47/80 & I shot a score of 44/80. Harold Forcum won it that year with a score of 53/80 and Steve Garbe was second with 49/80. In 1993, I teamed up with 2 other shooters from Big Timber, Bruce Powers and Harvey Behm. We took second place National BPCRS Champion Team. I won Match 1 with and Match 3 with 86/120 to end up 2nd overall. Lee Johnson won the Championship with 88/120. The next four years I spent shooting several different guns & bullets. This was a lot of fun but not very good for high scores. In 1998 I started shooting a Winchester Hi-Wall with a Badger 40/65 barrel with my wife, Gayle spotting for me and everything came together. We won the Southern California Regional at Pala, the Idaho State Championship, the Fort Chadbourne, TX Fall 2-day match, the Wyoming State Championship, and the BPCRS Nationals in Raton (91/120). We were also 2nd overall at the East West Silhouette Championship at Miller Kansas. In 1999, we won the Idaho State BPCRS Championship again & during the BPCRS Nationals at Raton, we had a terrible first day with a score of 36/120 but came back on Match 2 with a 49/120 to end up 2nd overall. In 2000 we started shooting the Shiloh prize rifle, a 40-65 #1 Sporter we won at the Nationals in 1998. That year we won the Wyoming State Championship and placed 2nd overall at the East West Challenge at Miller, KS again. We also ended up 2nd overall at the BPCRS Nationals at Raton with an 89/120 behind Dave Gruhler’s score of 94/120. 2001, still shooting the Sharps 40-65 #1 Sporter prize rifle from 1998, we won the BPCRS National Championship again in a shoot off against Buddy Visser with a score of 91/120. 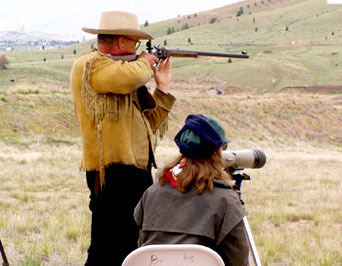 In 2002, we were 2nd overall at the BPCRS Nationals with an 85/120 behind Joe Scott (with his wife spotting) with his Score of 88/120. 2003, during the BPCRS Nationals we took 4th Master with the score of 85/120. Dave Gruhler won it that year with his score of 93/120. 2004 we took 1st Master shooting 94/120. Brad Rice won the BPCRS Nationals that year with 97/120. In 2005 we started shooting a 45/70 for the first time. 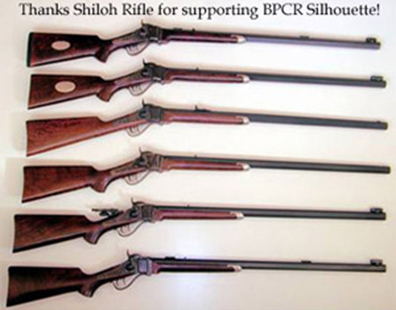 It was the 2001 Shiloh BPCRS National Championship prize rifle and is a 45-70 #1 Sporter. That year we won the Idaho State BPCRS Championship & Montana State BPCRS Championship (66/80). We ended up 10th Master at the BPCRS Nationals in Raton. Editor’s note: Steve was invited to the North Dakota 2006 State BPCRS Championship, Sep 23 & 24. Steve offered me the opportunity to compete with one of his Shiloh Sharps. I said that I have only shot at the silhouettes when I visited him in Montana. Well, he twisted my arm until I relented. Too bad for him! Ken Heier offered to help, but I said “Thanks”, but I didn’t need it because I was going to cheat—Steve was my armorer and spotter. I won the event with a score of 47/80. Steve was one point behind with a 46/80. The event was one of greatest time of my life and I owe all to Steve. A. 1998 BPCRS Championship prize rifle. B. 2001 BPCRS National Championship prize rifle. This rifle was won using rifle A with a 40/65 barrel. C. 2002 BPCRS Championship High Shiloh prize rifle. This rifle was won using rifle A using a 40/65 barrel. D. 2004 BPCRS Championship High Shiloh prize rifle. This rifle was won using rifle B using a 40/65 barrel. E. 2005 Montana State Championship prize rifle. This rifle was won using rifle B with a 45/70 barrel. F. 2005 BPCRS Championship High Shiloh prize rifle. This rifle was won using rifle B with a 45/70 barrel. Black Powder Cartridge Rifle Silhouette was organized in 1985 when 34 competitors got together at the NRA’s Whittington Center near Raton, NM to attend a match. The next year 50 people competed in a BPCRS match there. In 1987, the NRA organized a National Championship held at Whittington Center and 71 shooters attended. BPCR Silhouette has grown every year and now we have 350 or more competitors at the National Championships. There are many ranges all over the country that hold BPCRS matches. In Black Powder Cartridge Rifle Silhouette, competitors knock down life sized metal targets using original or replicas of exposed hammer single shot American rifles preceding 1896 with black powder cartridges. 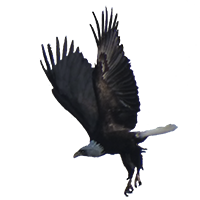 There are 10 targets each of chickens (200 meters), pigs (300 meters), turkeys (385 meters), & rams (500 meters). Chickens are shot offhand and the other three targets can be shot prone, sitting, or offhand with cross sticks. Competitors have a 5 minute period to shoot each bank of 5 targets. This is a spectator friendly sport because the hits and misses can be seen by everyone behind the firing line.